Apr 1, 2019 – TORRANCE, Calif. 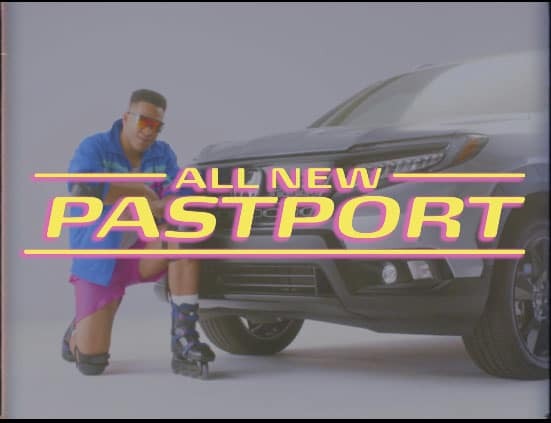 Spurred by the resurgence of nineties pop culture, Honda is introducing the ’90s-themed Pastport as a new trim available in the all-new Passport lineup. The exclusive Pastport trim is unlike any SUV available today, showcasing the sleek exterior of the all-new 2019 Honda Passport (https://automobiles.honda.com/passport) with a masterfully simple throwback interior highlighting popular ’90s features, such as automatic windows, plush micro-fiber seats, a cassette player and a mount for a beeper. The Honda Pastport will be available in early April 2019 at Honda dealerships nationwide. To introduce the Pastport, Honda is launching an integrated marketing campaign that fully embraces ’90s aesthetic with a new TV spot shot in a 4:3 format and standard definition (https://honda.us/Pastport). The :60 commercial debuts on Honda’s YouTube channel today with additional versions of the spot featured on Honda social media channels, including Twitter (@Honda), Facebook (https://www.facebook.com/Honda/), and Instagram (@Honda). Fans of the Honda Pastport can dial 1-833-PASTPORT to listen to a very special message from Fred Savage, who also happens to be the official voice of the Honda brand. Callers are encouraged to leave a detailed message on the Company’s microcassette answering machine explaining why they’d like to own a Pastport. The Pastport hotline will be promoted throughout the marketing campaign and is featured during the commercials. The 2019 Passport is the newest addition to Honda’s award-winning SUV lineup and delivers a unique combination of on-road driving refinement and off-road capability, along with best-in-class interior space. Designed for adventure-seekers who want the exceptional on- and off-road capability of Honda’s available i-VTM4™ torque-vectoring all-wheel drive system, the power and towing capability of its 280-horsepower 3.5-liter i-VTEC® V6, and the more personal and rugged character of a five-passenger SUV, Passport fits between the refined and compact CR-V and the larger, family-focused three-row Pilot. The all-new 2019 Honda Passport comes standard with 20-inch wheels, a blackout grille, the Honda Sensing® suite of advanced safety and driver-assistive technologies, as well as higher ground clearance and wider track than the three-row Pilot. Along with Passport’s best-in-class interior passenger space and total interior volume, the SUV features a large “basement” cargo area ideal for storing dirty gear or keeping valuables out of sight. Key premium technologies available on Passport include in-vehicle 4G LTE Wi-Fi, Apple CarPlay® and Android Auto™ integration, a high-resolution 8-inch Display Audio system, heated and ventilated front seats, wireless phone charging and more. Honda offers a full line of reliable, fuel-efficient and fun-to-drive vehicles with advanced safety technologies sold through over 1,000 independent U.S. Honda dealers. The Honda lineup includes the Fit, Civic, Insight, Accord and Clarity series passenger cars, along with the HR-V, CR-V, Passport and Pilot sport utility vehicles, the Ridgeline pickup and the Odyssey minivan. Honda has been producing automobiles in America for more than 35 years and currently operates 19 major manufacturing facilities in North America. In 2018, more than 90 percent of all Honda brand vehicles sold in the U.S. were made in North America, using domestic and globally sourced parts.